Last year FSP introduced one of the world’s first commercial liquid-cooled PSUs for PCs, the Hydro PTM+ with the maximum output of 1400 W. Quite naturally, such a beast carries a price tag that is reachable only by enthusiasts with deep pockets, so this year the company intends to launch a cheaper liquid-cooled PSU that is rated for up to 1000 W while also boasting RGB lighting. 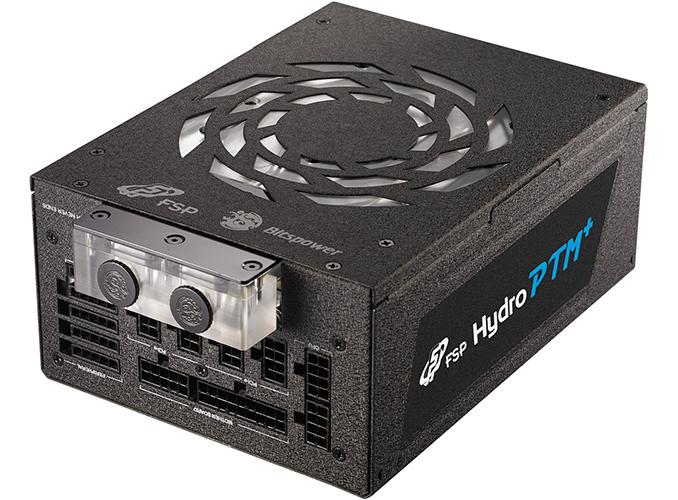 The FSP Hydro PTM+ PSU will be rated for 850 W when cooled only by its internal fan, but will output up to 1000 W if a liquid cooling system is attached. Meanwhile, just like the case of the Hydro PTM+ 1200 W/1400 W power supply, under normal circumstances the new Hydro PTM+ 850 W/1000 W PSU will only turn on its fan when its load exceeds 50%, so in most of the non-gaming/light load cases it should remain utterly quiet. As an added bonus, FSP will equip the new Hydro PTM+ power supply with RGB lighting (which I expect will be compatible with the ASUS Aura Sync lighting controls). FSP will demonstrate the new PSU at Computex (stay tuned with us for the Computex coverage next week), so it is not disclosing the PSU's exact specifications just now. But expect the new power supply to be compliant with the ATX12V v2.4 and EPS12V v2.92 standards as well as support all the latest CPU/system power states. Given the positioning of the Hydro PTM+ series, it is also logical to expect the new unit to be fully modular. It is unclear when FSP plans to start selling the Hydro PTM+ 850 W/1000 W PSU and at what price. Meanwhile, it's worth keeping in mind that the Hydro PTM+ 1200 W/1400 W was largely an experiment, which took quite some time to develop into a commercial product and which solved inevitable teething troubles of the design. Therefore, expect the new unit to arrive this year (though, only time will tell).